Looking for a neighborhood a cut above the rest? Well then Emberwood might be the perfect neighborhood for you. This lovely gated community in south Shreveport has beautiful houses from the 70’s, 80’s, and 90’s built in many different craftsman styles, sure to inspire the image of a perfect home in the minds of potential residents. Emberwood is just off of the trendy Line Ave, and directly adjacent to the 3132 inner loop. This means you can get across town in a hurry, or drive out the gate and immediately be on Shreveport’s main street. Line Ave is home to some of the nicest and most diverse shops and restaurants in the area, and the 3132 Inner Loop provides quick access to I-49, I-20, and Bert Koons. This puts Emberwood only minutes from Willis Knighton Pierremont, Tinseltown/Cinemark movie theaters, Youree Drive, Willis Knighton South, and many of the nicest private and public schools in the city. But convenience isn’t what this community is all about. 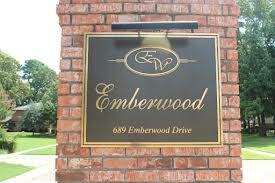 Emberwood is safe, clean, and well maintained by all that live here. Homeowners take pride and it shows. So make sure to visit Emberwood for everything it has to offer.